It was a movie ending for baseball’s biggest superstar. In his final at bat in the Bronx, at Yankee Stadium, Derek Jeter had a game-winning walk off hit in the bottom of the 9th, to give the Yankees a 6-5 victory. It seemed like he was going to get a good enough ending in the 7th, when he knocked in the then, game-leading RBI, on an infield grounder that got thrown away. It was to be his final time running down the first base line at the new Yankee Stadium. But the script was not quite perfect yet. Closer David Robertson, standing on the same mound Jeter’s long-time teammate, the greatest of all time, Mariano Rivera, used to call home, gave up 3 runs in the 9th. And with Derek due up 3rd, the plot was set. Jose Pirela hit a lead off single. Brett Gardner bunted him over to second. And Derek Sanderson Jeter was going to give the fans one last special memory. He knocked Evan Meeks’ pitch into right field, just far enough to get pinch runner Antoan Richardson home, and in front of his former championship teammates Jorge Posada, Tino Martinez, Bernie Williams, Andy Pettitte, Rivera, and former manager Joe Torre, Jeter got to celebrate in front of his home crowd. For an athlete already with so many historic moments, from “The Flip Play”, to “The Dive”, to becoming “Mr. 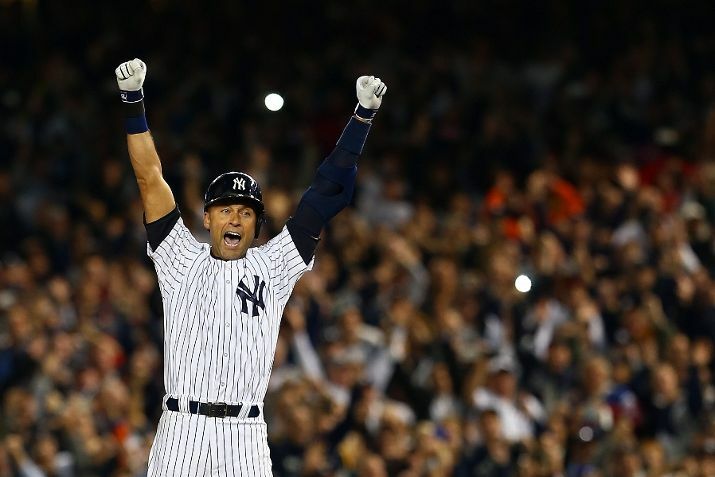 November”, one more electric moment was waiting for his final time in Pinstripes. We will too. Thank you, Derek. #RE2PECT.